Additional information and pictures courtesy of Mrs Kit Greenhalgh and Mr Mervyn Russen. Died: 4th May 1918; age 18; KiA. 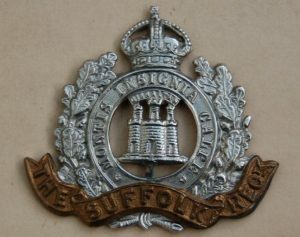 Relatives Notified and Address: Son of Robert (late Sergeant, 4th Battalion, Suffolk Regiment) and Eliza Russen, of 6, Suffolk Road, Ipswich. 1901 77, Livingstone Street, Norwich, Norfolk. Robert Russen, 23, a Chair Maker; born Norwich, Norfolk. Eliza Russen (nee Townshend),27; born Norwich, Norfolk. 1911 6, Suffolk Road, Ipswich. Robert was 11 years old and living with his parents & siblings. Robert, 34, a Chair & Cabinet Maker, own account. Eva Russen, 8, born Norwich, Norfolk. Blanche Lillian Russen, 6, born Norwich. 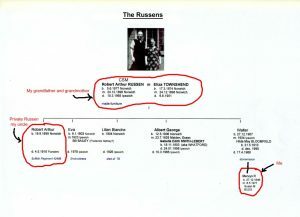 Albert George Russen, 4, born Norwich. Walter Russen, 3, born Norwich. 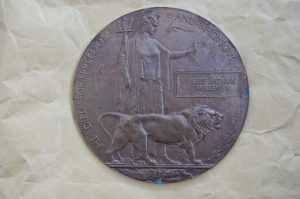 Robert is also remembered on the war memorial at St. Margaret’s Church, Ipswich. I remember Grandad Robert Russen (senior) telling me that his first experience of being attacked with gas was at the Second Battle of Ypres (“Wipers” as they called it) in April 1915. 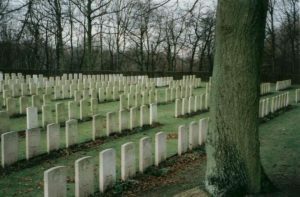 The gas used was chlorine a heavy yellow-green gas which rolled over the ground into the trenches and is a dreadful lung irritant. Chlorine damages the lining of the lungs making it impossible for it to absorb any fluids generated in the lungs, hence men literally drowned in their own bodily fluids. Grandad was given the order to urinate into a sock and pull it over his head. The theory was that the ammonia in the urine would react with and neutralise the effects of the gas. There were no gas masks at that stage and effective gas masks were not made standard issue until a year later in 1916. Many men who experienced the horrors of World War One never mentioned them. Grandad was not one of those men and I eagerly sat at his knee listening to his stories as a boy much to my mother’s chagrin. My father had heard them all. I remember Grandad telling me about one of his men being very hungry and when they entered a devastated French or Belgian village he found a big jar of jam. He loved it so much that he went over the top with it and was shot through both knees as a result. Going “over the top” was the worst experience any man could experience he said. Men threw up and were tearful as they stood on the firing step ready to climb into hell. If you lasted a fortnight on the Western Front then you might last a month. It was a case of knowing the ropes. In 1917 he remembered the Americans arriving on the scene and how they smoked when on patrol at night not realising that a burning cigarette end can be seen a mile away. He said the German snipers had a field day. The closest he came to being killed was when a piece of shrapnel cut through his uniform and entered a book which he carried in his breast pocket. The shrapnel rubbed against and grazed his skin. He was blown up several times and buried but survived it all; the Somme, the mud of Passchendaele….all of it. He remembered lying in the trenches at night and feeling warm. When first light came he found that the warmth came from rats sleeping in all the warm areas of his body: under his arms; in his groin; behind his knees. He was promoted in the field and ended the war as a Company Sergeant Major (CSM). My dad said that he had terrible nightmares for long after the war and, for a while, found it very difficult to sleep in a bed. In late 1917 young Robert Arthur (junior) , my uncle, was called up at the age of eighteen. He went to Sherwood Forest near Nottingham for basic training. He wrote a letter to his mother whilst there and it is so matter-of-fact. 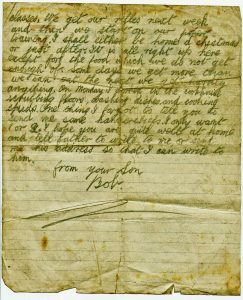 A boy writing to his mum thanking her for a towel and “fags”, telling her what is happening to him and asking her to get his dad to write to him from France. I think it is all the more poignant because of its simplicity. During his time at Clipstone he made friends with Bernard Stoner, a lad from Worthing in Sussex. They remained friends as members of 14th Platoon, Z Company, Second Battalion of the Suffolk Regiment when it embarked on its way to Europe. He came home before going to France and left Suffolk Road with his father who was also home on leave. 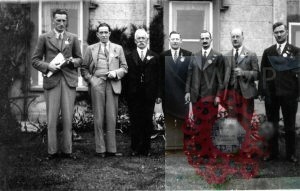 My dad remembers standing with his brother and mother at the front door as they waved them goodbye. Eliza said to them that dad would come back but she had a premonition that Bobby would never return. Dad never forgot that moment particularly in light of later events. 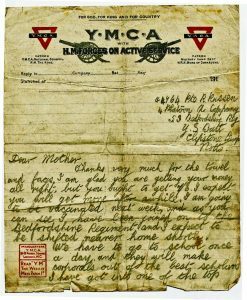 Bob’s officer’s field diary for Saturday 4th May 1918 records that they were in the Hinges region. An orchard nearby was captured by the Gordon Highlanders; two machine guns and thirty prisoners were taken at 0230 hours. Later the right two posts advanced successfully with the capture of three prisoners. At first light Robert, Bernard and their mates were sent out on a working party to lay barbed wire. During that task Robert was shot by a sniper within a yard of Bernard – he was apparently killed outright. 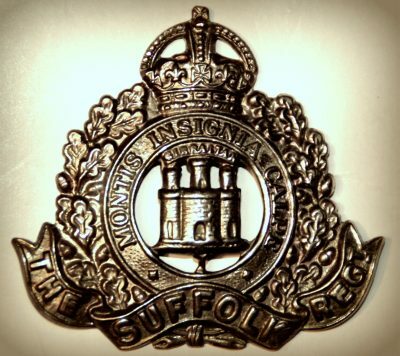 The Suffolks were relieved by the 4th Royal Fusiliers later that day when they withdrew to Chocques, 5.7 Kilometres away. Four of Robert’s mates were wounded on that day. Bob’s death is recorded as “1 O.R. killed” – i.e. one “Other Rank” killed. Only dead officers were ever named in field diaries. It is with great regret that I scribble you these few lines. Early this morning, while on a working party I am extremely sorry to say your son Bob was killed. I was one of the party and he fell about a yard from me. I have known him since October, in camp with him, in billets with him. We had always been the best of friends. On behalf of the rest of his chums I tender you my sincere sympathy. I thought it would only be right that you should know as soon as possible, as it might have been weeks before you heard officially, again expressing my sympathy with your family. It seems such awful bad luck since he was so young and had been out here such a short time. However, take comfort in the fact that he died bravely trying to save England and all we hold dear from the cruel hand of the enemy which has been felt so much in this country. His letters and other personal property will be forwarded on to you in due course. 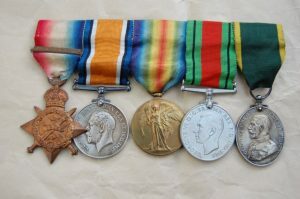 G M Aird 2nd Lt.
Our Padre has just told me that the funeral takes place this afternoon. GMA. 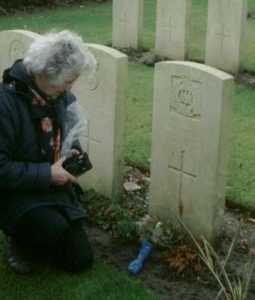 Bob was buried at Sandpits British Cemetery at Fouquereuil, Pas de Calais. 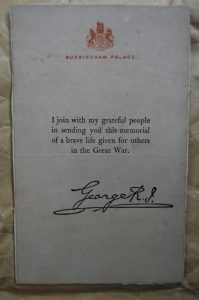 The War office officially informed Eliza of her son’s death on the 15th May 1918. They also sent a pro-forma in October referring to Bob’s will. Every soldier going into combat writes a will. The form was accompanied by a death certificate. 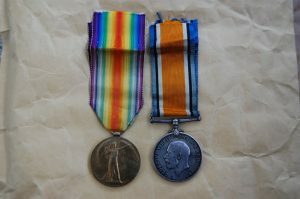 On the 6th November 1918 Eliza was awarded a pension of five shillings per week as a result of Bob’s death. On Christmas Eve 1919 Eliza also received the residue of Bob’s estate which amounted to the princely sum of £3. 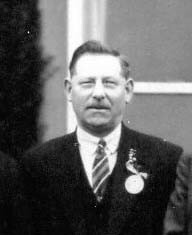 Unfortunately Bernard Stoner was killed three months following Bob’s death. The war ended in 1918 and life would never be the same again. Eliza had survived, bringing up her children entirely on her own. She was less than five feet in height but she did have spirit and as far as some things were concerned she was fearless. 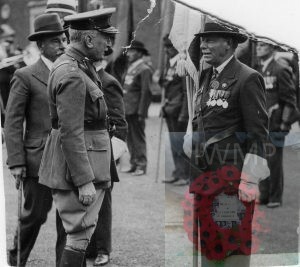 A greying but proud CSM Robert Russen (senior) at a Remembrance Day parade Christchurch Park.